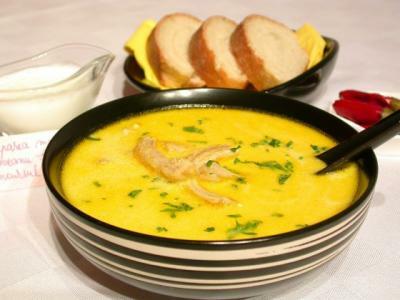 Tripe soup is a common dish in Balkan, Bulgarian, Greek, Turkish, and Eastern European cuisine. It is widely believed to be a hangover remedy. bit of oil, called mujdei. called borș (fermented wheat bran). It is often seasoned with vinegar or lemon juice. velvety, fatty but delicate, eclectic and simple at the same time." 1. In a large pot add the beef bone and put approx. 4 litres of cold water. When the water starts to boil remove the foam. 2. Add the vegetables (1 carrot, parsley root, celery) and the bay leaves. Allow to boil for approximately one hour and half. Then strain the broth. 3. Separately, in a saucepan, heat the oil, and then add half the grated carrot. Cook until soft, then pour the stock, the tripe (cooked and drained well), and the salt and put to boil on a low heat for five minutes. 4. n a bowl mix the sour cream with the eggs, then carefully add a few ladles of hot soup, stirring all the time so the egg mixture doesn't curdle. Then add to the soup pot, again stirring gently, carefully, so the soup does not turn to cheese. 5. Crush the garlic cloves, add a ladle soup over them, stir, then strain and pour the garlic stock obtained into the soup. 6. Serve hot as desired with sliced ​​hot peppers, ground pepper, sour cream and lemon juice or vinegar. This is a very healthy soup recipe. You could, perhaps, serve with some yoghurt rather than the sour cream.